Around the country, advertising revenues are dropping precipitously. From traditional bastions of print media to online news outlets, any business dependent upon advertising is feeling the crunch. The MTA is no exception. As revenue goes, advertising isn’t really a key source of money for transit systems. In total, according to the Federal Transit Administration numbers, transit agencies drew in $334 million in revenue in 2007. That total makes up around one percent of nationwide transit revenue. Closer to home, the MTA reported over $100 million in revenue in each of the last two years. 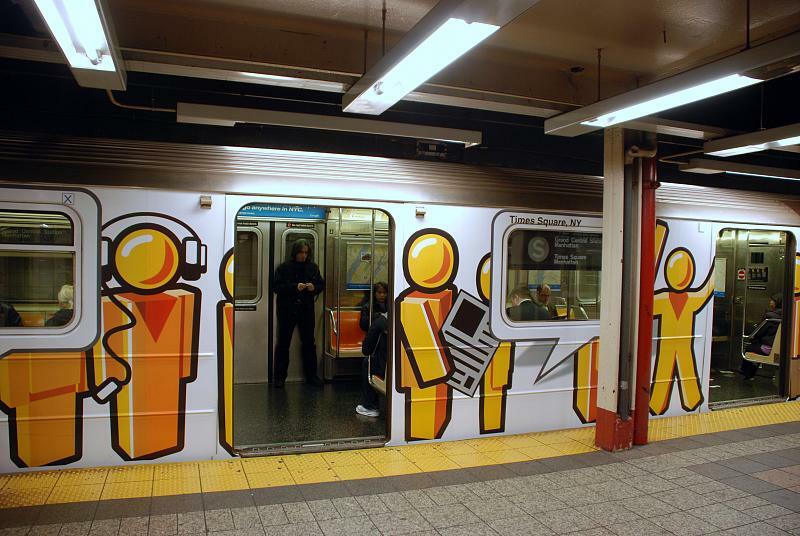 Neuman’s article is chock full of interesting information about subway and bus advertising. For example, an ad on the outside of a Manhattan-based bus sells for $1500 a month this year. In 2008, the MTA could command $1800 for the same ad. On the business side, overall sales for CBS Outdoors, another MTA advertising partner, are strong due to the new ad spots on the outside of train cars. Titan, on the other hand, still owes the agency money from last year, and the agency may have to renegotiate its deal with the MTA to avoid incurring crippling penalties and payments. Neuman also notes that Titan’s original bid for the 10-year contract with the MTA was for $103 million more in minimum guaranteed payments than the next highest bidder. William Apfelbaum, the company’s chairman, said that the difference in minimum payments would not impact his company were the economy strong. In the end, the MTA isn’t really relying on advertising revenue for a significant portion of its budget, but the story remains the same: A public transportation agency should not have to attempt to squeeze every last dollar out of advertising just to stay afloat. We applaud the MTA for looking at new ways to draw in revenue through advertising, but as long as that money is icing on the cake and not a key part to the budget, we would have nothing to fear. Titan was the one who was put in charge of the localized digital bus ads right? Are the digital bus ads running in buses now? I remember hearing they were an expensive investment.